Ideally located in the Pyrenean Piedmont, 7 km from Argelès-Gazost, 8 km from Lourdes, 21 km from the resort of Hautacam and 35 km from Gavarnie, offers a beautiful view of the Pyrenees; it provides direct access to the Pibeste trails and the greenway for pedestrians, bicycles and rollers that connects Lourdes to Cauterets. 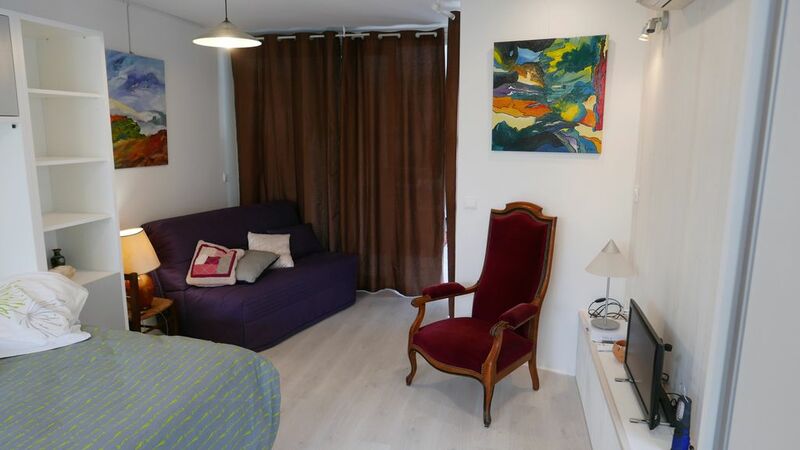 With a total area of ​​38 m2, it offers 2 rooms: 1 bedroom equipped with a bed cabinet allowing its transformation into sofa lounge for the day, a kitchen fully equipped dining room (oven, microwave, induction hob, refrigerator with freezer, dishwasher, washing machine, fruit and vegetable extractor robot, electric fryer). It also offers free internet access, TV and radio. Heating is provided by a reversible air conditioning system. The toilets are composed of a 1,70X1m shower cubicle, a toilet, a double sink, and a washing machine. The "pluses" of this rental are: sheets and towels provided, its brightness, an outdoor terrace of 60 m2, equipped with garden furniture, sun loungers, and sheltered by a closed arbor with lighting, a solarium area , a local bike, ski, shelter for dogs or cats, The bedding is of excellent quality, Private parking (closed) is available, air conditioning, and space for petanque (total surface entrance parking and petanque 300m2 ) .. Ideal for spa and long stay! near the thermal baths of Argelès-Gazost and Beaucens, the spa park and the Jardin des Bains, the aquatic center of Lau Balagnas. Un cocon pour des vacances. Le site est calme et agréable. Paradis pour randonneurs et cyclistes. Produit locaux de très bonnes qualités (Point vert) juste avant Argelès Gazost et "La caverne de l'Ours" à Argelès Gazost. Un accueil très cordiales par les propriétaires. Très bon accueil de la part des propriétaires. Logement bien situé et agréable. Je recommande. Many walks for hiking are possible without taking a vehicle. The low season prices are on all the year except July-August. Cette location est prévue pour 2 personnes, un supplément de 20€ pour une troisième sera facturé pour une semaine, non n'acceptons pas plus de trois personnes.